In the aftermath of disaster, Haitians ask what makes a city. Port-au-Prince was decimated when a magnitude 7 earthquake struck Haiti in January 2010. Buildings crumbled, the parks turned into tent camps for the displaced, rubble blocked the streets. But as the years progressed, from the balconies of Pétionville you could see something new taking shape in the distance, several miles north. Settlements began to appear on a barren landscape, shacks and tents spreading over dusty plains. No land titles were given, and there was no guarantee of how long people would be allowed to stay. Nonetheless, desperate for space, tens of thousands of Haitians flocked to the area, arriving from the camps that had erupted throughout the capital. Some came from places that were hardly affected by the earthquake at all but who’d been living indebted to landlords, paying hundreds of dollars in rent each year, in a country where most people live on less than $2.50 a day. Establishing a foothold here was a way to become homeowners for the first time, and to finally escape the noise and hustle and violence of the cities they found so suffocating. Honey or not, this emerging city is the earthquake’s most visible legacy: an enormous expanse of winding dirt roads lined with houses, scattered among which are thousands of shops and markets. Into this labyrinth, an army of NGOs, charities, and international agencies have arrived to infuse Canaan with public parks and plazas, drinking water and money for schools—things the Haitian government has neglected to provide. But with these gifts come tension: Suddenly there are resources to compete for, and an incentive to be the one in charge of allocating them. NGOs aren’t the only force complicating Canaan’s fate. Haiti’s government itself has been playing catch-up, struggling to create a social contract between people and their government. As to which comes first—the rights or responsibilities of citizens, the roads or the taxes—the state and the citizens don’t easily agree. And if that weren’t enough, Canaan’s very existence is being threatened by a man who claims that the land upon which it was built was taken from him illegally—a claim Haiti’s government has every incentive to ignore. In Canaan, as in any city, people—the rich and the poor, the powerful and weak, the complacent and the desperate—were destined to get in one another’s way. Reporting for this story was supported by a grant from the Pulitzer Center on Crisis Reporting. It was featured as an Editor’s Pick on LongReads. Who Owns What in Haiti? 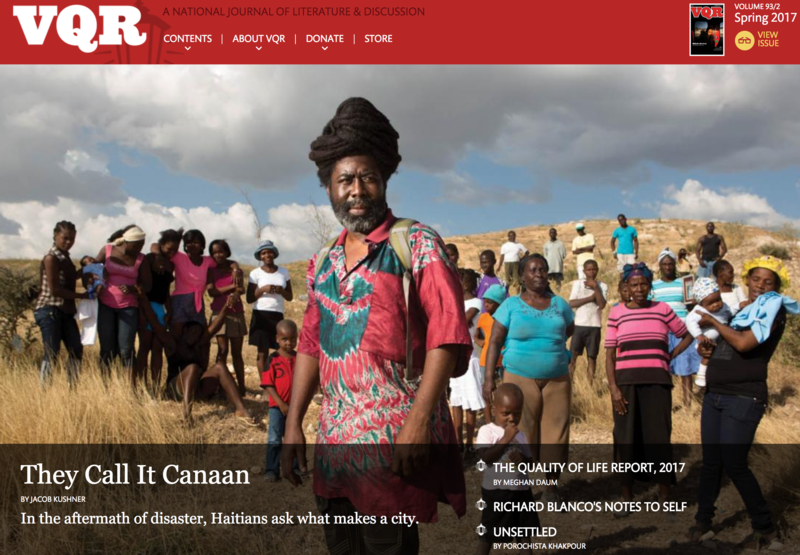 In the wake of the massive earthquake that struck on January 12, 2010, resolving long-standing land-ownership issues has been a low priority for Haiti’s leaders, even as they regard tourism, mining, and other industries affected by questions of title as crucial to the island’s economic development. France is helping to fund Haiti’s land-management office, but the Haitian government hasn’t allocated the resources it would take to create a national cadastre (a survey of the country’s land). Joab Thelot, a coordinator for the National Office of the Cadastre, says that it wouldn’t take much—just three million dollars a year—to pay the salaries of trained surveyors and buy the vehicles they would need to get around. In recent years, though, Haiti’s parliament has allocated his office just a third that amount. Uncertainty over land ownership has played out across Haiti as the country attempts to attract foreign investment in tourism, mining, manufacturing, and agriculture—often without clear knowledge of who, precisely, owns what. Reporting was supported by a grant from the Pulitzer Center. IlE-A-VACHE, Haiti — One day in October, 81-year-old Mascary Mesura was working in his garden of corn and coconut trees when the mayor of this small island off the southern coast of Haiti approached and told him to get out of the way. 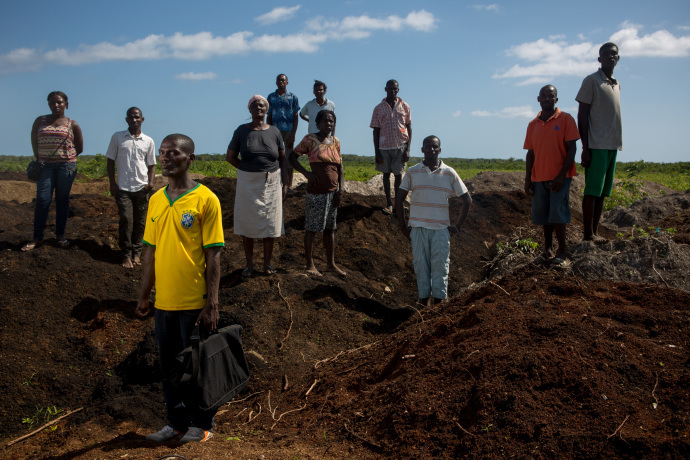 The mayor, Fritz César, stood and watched while police handcuffed Mesura and his wife, forcing them to watch as their livelihood was uprooted, all 28 of their coconut trees toppled to make room for a fish pond to feed tourists. The demolition was part of the Haitian government’s $260 million plan to develop Ile-a-Vache into a Caribbean tourism destination akin to the Bahamas or St. Martin. Five years after a 7.0 magnitude earthquake ravished an already troubled nation, Haiti’s leaders hope tourism along with mining, manufacturing and agriculture will help the country leave its legacy as an impoverished nation behind. Read the full GroundTruth story on GlobalPost. January marks the 5th anniversary of Haiti’s devastating earthquake. The country’s leaders are trying to move the nation past the “recovery” phase and into the future as a middle-income nation that attracts tourists and their money. Across the border in the Dominican Republic, which shares the island of Hispaniola with Haiti, tourism is the No. 1 driver of GDP, and Haiti wants a piece of the action. Beset by a string of misfortunes and natural disasters, Haiti isn’t many people’s idea of a fun Caribbean getaway. But one Wisconsin couple have been vacationing there for half a century, through all the troubles, and they just can’t figure out why they’re a rarity. Thousands sought refuge on the island of La Gonave four years ago. But little help ever arrived, something permanent residents know all too well. ANSE-A-GALETS, Haiti — To traverse the 13-mile stretch of Caribbean Sea to the island of La Gonave, one must choose between three types of boats, none particularly safe. First there are the “fly boats,” speed boats with outboard motors that race a dozen people from one side to the other. From time to time they flip over. Few records exist as to how many people survive. Then there are the two large steel ferries that carry a few hundred passengers slowly across the sea each day. In 1997, one of those ferries sank, killing 200. Last, there are the sailboats — wooden ships built from hand-carved lumber and pieced together with hammered nails. Their canvas masts are reminiscent of those in the “Pirates of the Caribbean” movie franchise. They carry everything from rice to dry cement, motorcycles, cars and trucks. In better times, Haitians travel to and from the 300-square-mile island as a matter of routine, however risky. In times of emergency, like the massive earthquake of four years ago, they come to La Gonave in droves. In the first 19 days after the earthquake, 630,000 people fled Port-au-Prince, 7,500 of them to La Gonave, according to a 2011 study. Untold thousands more fled there from other earthquake-affected areas. Some NGOs put the total at 20,000, which would mean the island’s normal population of approximately 100,000 increased by between 15 and 20 percent almost overnight. To feed and house them all would have required a substantial amount of the $9 billion pledged by international governments for Haiti’s recovery. 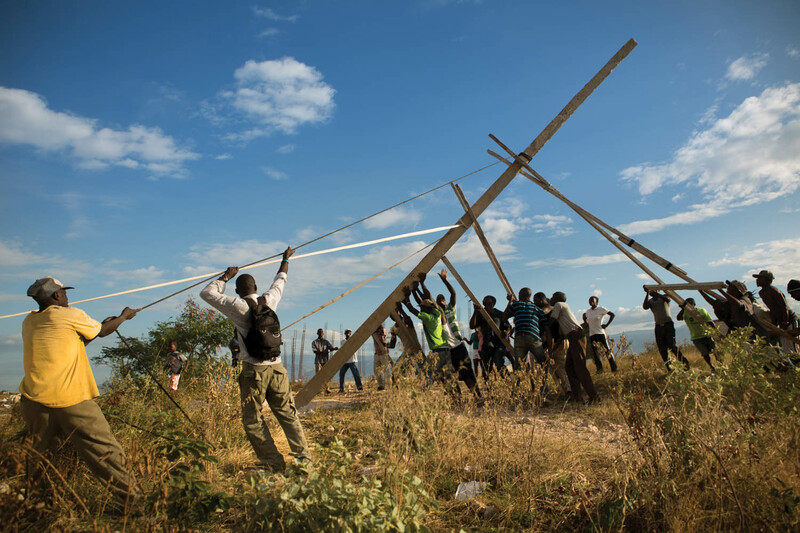 But little of that aid — or the aid allocated by private donors — reached the people of La Gonave, GlobalPost found. Most of the migrants returned to the mainland in the months after the earthquake, leaving permanent residents in a dire state. Read the full story at GlobalPost. 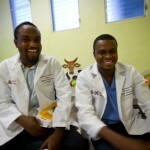 Pediatricians in residence Dr. Roosler Billy Telcide, 27 (right), and Dr. Ben Bechir Beaubrun, sit in the children’s waiting room at the Partners in Health University Hospital in Mirebalais. Telcide said he’s excited to learn first rate patient care at the new facility– and to carry those standards with him as he practices medicine to his hometown once he completes his residency. MIREBALAIS, Haiti — When Roosler Billy Telcide completed medical school in Port-au-Prince, his hopes for finding a residency to prepare him for a career as a pediatrician were modest. “I had a dream when I was a medical student to do my residency where I can find a scanner, an MRI, and all those things Partners in Health has,” said Telcide, 27, in reference to Boston non-profit whose state-of-the-art teaching hospital opened last year in the town of Mirebalais, north of Port-au-Prince. Read the full story as it appeared at GlobalPost.